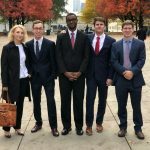 Junior FMI Scholar Jonathan Zaremba was a member of MSU’s Fed Challenge Team that competed in Chicago on October 31, 2018. The team then answers questions from a panel of judges for 15 minutes. Dr. Aeimit Lakdawala from the Department of Economics coached this year’s team. Joining Jonathan as team members were Jake Knoblauch, Callie Moffett, Jacob Robart and Joshua Webb. Jack Bartoluzzi and Hunter Kucheck supported the team.